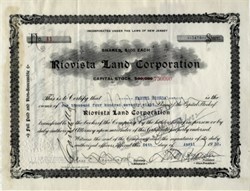 Beautifully printed stock certificate #49 from the Riovista Land Corporation issued in 1934. This historic document was printed by the Broun Green Company and has an ornate border around it with a vignette of the company's name in clouds. This item has the hand signatures of the Company’s V. President and Secretary. This certificate was issued to Manuel Rionda and endorsed by him on the back. Manuel Rionda (1854-1943), immigrated from Spain to Cuba when he was 16. He become the major player in the international sugar trade. Manuel Rionda founded the Czarnikow Rionda Company in New York and the Cuban Trading Company. In 1904, Manuel Rionda bought 13 acres and by the time of his death his estate had grown to over 200 acres. The property was owned by the Riovista Land Corporation which was incorporated in 1922. The property ran from the middle of Cresskill to the edge of the cliffs along the Palisades. It included a man made lake, as well as a large gothic medieval looking stone clock tower he constructed as the centerpiece of the Rio Vista estate. The path to the tower was surrounded by cedars and the tower had an iron elevator and was flanked by a library and a chapel. As the story goes, Manuel Rionda built the tower so his wife Harriet could see New York without having to leave the property. Supposedly, his wife was looking out from the top of the tower and saw her husband with another woman. She was so upset, she jumped to her death down the center of the tower in 1922. Manuel was so upset that he stopped all the work on the tower because it was for his wife and now his wife was dead. 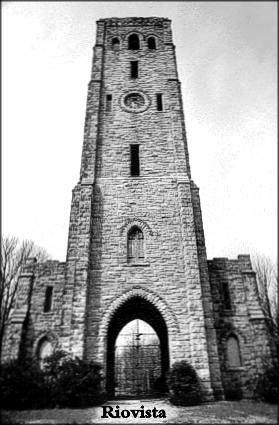 The tower is still haunted by his wife according to local folklore and is known as the "Devil’s Tower". Harriet was interred in a mausoleum on the property. Rionda always shared his property with others, creating essentially a public park. People came from miles to walk the flower lined carriage paths and to swim in the lake. Eventually Rionda offered the property to the town of Alpine to become a public park, and amazingly they rejected the offer. He sold the land instead and that now became the Tammybrook Country Club. The rest of the property would eventually be sold off after his death and the tower is now the last structure that remains. When he died, Rionda required his wife be removed from the mausoleum, and that he and his wife were to buryed at the Brooklawn Cemetery in Englewood where they remain to this day. Lewis Benjamin was one of many traders buying and selling a variety of commodities in Manhattan’s vibrant financial district. In 1873, Benjamin and Joaquín Rionda y Polledo (1850-1889) formed the partnership of Benjamin, Rionda & Company. Joaquín Rionda was the middle brother in a family of six sisters (Maria, Isidora, Gregoria, Ramona, Concepción, and Bibiana) and three brothers (Francisco, Joaquín and Manuel), offspring of Don Bernardo de la Rionda y Alvarez and Doña Josefa Polledo y Mata. All were born in the village of Noreña in the Oviedo district of Asturias. Francisco Rionda y Polledo The eldest brother, Francisco (1844-1898), resided in Cuba most of his life. It is uncertain when he arrived in Cuba, but he worked with his uncle, Joaquín Polledo, in the firm Polledo, Rionda & Company. The company was a sugar export house with its office and warehouse in Matanzas. The family also owned sugar plantations near that Cuban port. By 1875, Francisco had married Elena de la Torriente, the daughter of one of Cuba’s wealthiest sugar barons. His father-in-law, Cosmé de la Torriente, awarded him management of a sugar estate dubbed La Elena after Francisco’s bride. Thus, the partnership of Benjamin, Rionda & Company united the sugar fortunes of the Riondas, Polledos, and de la Torrientes with Benjamin’s North American and European trade connections. Joaquín would further cement the relationship by marrying Benjamin's daughter, Sophie, who died in 1877 after giving birth to their only child, Manuel Enrique Rionda. The previous year, Lewis Benjamin died leaving Joaquín the senior partner in what was now known as Rionda, Benjamin & Company. The Polledos and Riondas also enjoyed a long and profitable association with George S. Hunt, owner of the Eagle Sugar Refinery at Portland, Maine. In addition to the refinery, Hunt operated a fleet of ships that traded primarily in Maine lumber products and Cuban sugar and molasses. Hunt took under his wing Joaquín and Manuel when they came to America and oversaw their preparation for the business world. Joaquín spent his adolescent years at the Abbott School in Farmington, Maine, before he settled in New York City. Manuel (1854-1943) left Spain in 1870 and followed Joaquín at the Abbott School before joining his brother at Benjamin, Rionda & Company in 1874. In the meantime, Francisco and his uncle enlarged their Cuban sugar holdings. By 1877, they had acquired the Central China and contracted with Franklin Farrel of the Farrel Foundry and Machine Company of Ansonia, Connecticut, to modernize the estate’s industrial plant. However, debts incurred by the purchase of expensive mill machinery, coupled with declining sugar prices, forced the bankruptcy of Polledo, Rionda & Co. in December, 1878. $400,000 of that debt was to Rionda, Benjamin & Co.
As part of a 1880 court settlement of Polledo, Rionda’s remaining assets, the Rionda brothers acquired the Central China and the Matanzas warehouses. Joaquín subsequently moved to Cuba to take charge of the Central China. Francisco continued at the Elena estate until the de la Torrientes sold it. He then joined Joaquín at the Central China. Manuel also moved to Cuba and assumed control of the Matanzas warehouses for a brief period. While all three of the brothers were in Cuba, the New York business was left in the hands of a partner, Hugh Kelly. Quickly, though, the business network began to crumble. By 1883, Rionda, Benjamin & Co. was declared insolvent. Manuel returned to New York and attempted a new partnership with Kelly, but that lasted only a year. The Matanzas operations also failed and the Central China eventually became the property of the New York Sugar Manufacturing Company, established by Farrell, Kelly and Lewis Cooke. The Riondas then focused their energies on sugar properties they acquired in the vicinity of Sancti Spiritus in Santa Clara province. Manuel returned to Cuba briefly to work with his brothers. By 1886, though, he was back in New York working with the firm of J. M. Ceballos & Co.
Manuel Rionda remained in the firm of J. M. Ceballos & Co. for approximately ten years. During that time, he established a sound reputation among Wall Street’s sugar brokers and important links with Cuba’s sugar producers. In 1896, he left Ceballos and became a commission agent in Czarnikow, MacDougall & Company (est. 1891). Czarnikow, MacDougall was the North American branch of the eminent London trading house C. Czarnikow, Ltd., one of the world’s largest sugar traders. While Manuel’s star rose in New York business circles, his brothers continued to expand and modernize the family’s sugar properties in Sancti Spiritus. Manuel’s employer, Juan Ceballos, was encouraged to invest in the venture and the Central Tuinucu Sugar Cane Manufacturing Company was incorporated in New Jersey in 1891. (The company’s name was shortened to the Tuinucú Sugar Company in 1903.) Tragically, though, Joaquín had died in a drowning accident while fording the Rio Tuinicú on April 7,1889. Francisco Rionda managed the cane fields and factory, and cane was ground at the new mill for the first time in 1895. Shortly after, the record narrative resumes. No sooner had Tuinucu’s new mill begun operations, but civil war in 1895 plunged Cuba into economic chaos. Cuba's sugar industry was devastated, and the Central Tuinucu was one of many plantations whose cane fields were put to the torch by Cuban insurgents. Francisco's letters to Manuel in Series 1 chronicle the turmoil of that period. Fearing execution by the insurgents, Francisco and other family members left Cuba in 1898. Before leaving, though, Francisco acquired a significant tract of land around the Bahía de Guayabal in Camagüey province. Manuel Rionda, Tuinucu, 1906 Francisco died in New York City in November, 1898, leaving Manuel as the head of the family's properties and businesses. By this time, the United States’ victory over Spain in the Spanish-American War had initiated a period of peace in Cuba under U.S. military occupation. Despite initial reluctance to continue in Cuba after 1898, Rionda decided to reinvest in the Cuban sugar industry. First, he was able to secure funds to revive Tuinucu. Then he organized a new company, the Francisco Sugar Company, to exploit the Camagüey land holdings acquired by his brother. Lacking capital of his own to build a sugar mill, Rionda sought out investors. The principal investors in the Francisco Sugar Company were the owners of the W. J. McCahan Sugar Refinery in Philadelphia. The McCahan group managed the company until 1909 when it relinquished ownership and control to the Riondas. Cuba’s war for independence also interrupted Rionda’s work in Czarnikow, MacDougall and forced the firm to seek alternative sources of sugar in Java, Peru, and Eqypt. With the end of fighting in Cuba, however, Rionda plunged into the work he had been hired to do. Ironically, the war had removed or hurt many of his competitors. With the capital resources of C. Czarnikow behind him, Rionda financed old clients and aggressively sought new ones. By 1903, Czarnikow, MacDougall was the dominant company in the Cuban sugar trade. When the company's senior partner, Caesar Czarnikow, died in 1909, a new company was organized. The Czarnikow-Rionda Company was incorporated September 1, 1909, with Manuel Rionda as its president. The new firm was a private company and management of the company was vested in the common stock owned coequally by five individuals. Four of the common stockholders were the remaining partners in C. Czarnikow, Ltd.; the fifth was Rionda. Consequently, control of the company remained in London. Rionda's relations with the other stockholders were never satisfactory. Rionda believed the Europeans were too conservative to effectively compete for the Cuban sugar market. The London stockholders, for their part, were wary of Cuba’s political instability. Incidents such as the Guerrito de Agosto, which resulted in a second U.S. occupation of Cuba in 1906, and a racial conflict in 1912 further soured business interest in the island. In 1915, Rionda announced his intention to retire from Czarnikow-Rionda. His aim was to create his own brokerage house with his nephews, Manuel (Manolo) Enrique Rionda and Bernardo Braga Rionda, as his seconds and successors. Negotiations between the New York and London offices led, instead, to a new five year agreement that reduced British participation in Czarnikow-Rionda. Rionda continued to serve as the company’s chief executive and chairman of the board. Between 1902 and 1922, the Riondas expanded their operations and holdings in Cuba. When several mills passed into the hands of Czarnikow, MacDougall after their owners failed to meet debt obligations, the Riondas stepped in to acquire and manage the properties. In this manner, the Riondas acquired the Central San Vicente in 1907. Another foreclosed mill, the Central San José, was reorganized as the Washington Sugar Company in 1911. Other acquisitions included the Central Elia, a sugar mill adjacent to the Francisco Sugar Company, and the Central Céspedes near La Florida in Camaqüey. Among the financial backers of the Washington Sugar Company was Walter E. Ogilvie, a North American businessman and a major stockholder in the United Railways of the Havana & Regla Warehouses. Rionda and Ogilvie would collaborate on other business ventures. Together, they organized the Regla Coal Company in 1911 and broke the Berwind White Coal Company's monopoly on coal distribution in Cuba. For a brief period in the early 1920s, Ogilvie served as Czarnikow-Rionda's president and attempted a reorganization of the company's operations. When the reorganization failed to bring the desired results, Rionda returned to his position as president. In 1907, Rionda began a long and beneficial relationship with the law firm of Sullivan & Cromwell. Several partners of the firm invested in the Stewart Sugar Company that operated a large sugar factory in Camagüey province. Rionda served as president during the construction of the mill and the company’s initial harvest. His success prompted further business collaboration with Sullivan & Cromwell, and Sullivan & Cromwell often served as legal counsel to the Czarnikow-Rionda Company. Sullivan & Cromwell also invested in the largest sugar mill constructed by the Riondas. In 1911, Rionda brought together a group of investors that also included Claus Spreckels, Edmund Converse, Regino Truffin, and the financial house of J. & W. Seligman to exploit extensive land holdings around the Bahia de Manatí. The Manati Sugar Company was an immense undertaking and presaged Rionda's most ambitious business venture, the creation of the Cuba Cane Sugar Corporation in 1915. Backed by the financial resources of the Morgan trust, Cuba Cane was able to acquire the properties of seventeen mills that controlled over sixteen percent of Cuba's annual sugar production. Rionda served as president of Cuba Cane from 1915 to 1920. The organization of the Cuba Cane Sugar Corporation in 1915 was encouraged by the rise in sugar prices brought on by the war in Europe. The entry of the United States in that conflict, however, produced demands at home and abroad for market controls. To achieve price stability and insure supplies of sugar at the same time, various national and international regulatory bodies were created. In recognition of Czarnikow-Rionda's influence in the sugar industry, Rionda was appointed by Cuban President Mario G. Menocal to the Cuban Commission. The Commission, which included Carlos Manuel de Céspedes and Robert B. Hawley, represented Cuba in international negotiations on sugar prices and allocations. Members of Czarnikow-Rionda also served on the Cuban Adjustment Committee, the Cuban Allotment Committee, and the Committee on Compensation to United States Brokers. Market prices for Cuban sugar were tightly regulated during the war, and Rionda played a prominent role in determining the price of Cuban raw sugar. Despite protests from Rionda and others in the sugar trade, the United States lifted price restrictions on raw sugar in 1919. The result was a frenzy of market speculation now known as the "Dance of the Millions." In the space of a few months, the price of raw sugar rose and fell dramatically ruining hundreds of planters and merchants in the process. In response to the market collapse, President Menocal named Rionda and several other sugar merchants to the Sugar Finance Committee. The Committee's task was to assist in financing and marketing the unsold portion of the 1920 Cuban harvest. The committee’s efforts were largely unsuccessful, and Rionda’s presence on the committee led to complaints of favoritism and charges of illegal business practices. Other attempts to control the marketing of Cuban sugar followed. In 1929, the Compañía Exportadora Nacional del Azucar, or Vendedor Unico as it was often called, was organized as a single cooperative agency for the sale of Cuban sugars. Rionda exerted influence in Vendedor Unico and its successor, the Cooperative Export Agency. Efforts to regulate sugar production and marketing on a world-wide scale were also made, and Czarnikow-Rionda participated in all of the early international marketing agreements. The company’s representative at many of the sugar conferences was Aurelio Portuondo, a Cuban lawyer and a vice-president in the Cuban Trading Company. Portuondo later represented the Cuban government in tariff negotiations with the United States in 1933 and was the company's principal liaison to the Cuban government for many years. In addition to Portuondo, Manuel Rionda corresponded with Thomas Chadbourne, the architect of the 1929 Chadbourne Plan. Rionda also carried on a lengthy correspondence with Viriato Gutierrez and José Miguel Tarafa. Both were prominent Cuban businessmen and important figures in international negotiations. The 1920s and 1930s marked a slow and steady decline in the Rionda business fortunes. The sugar industry had barely recovered from the effects of the 1920 collapse when the Great Depression brought new economic difficulties. The Francisco, Cespedes, and Manati sugar companies were forced into receivership and reorganized. Cuba Cane, in which the Riondas invested heavily, was a serious drain on the family’s resources and was dissolved in 1938. By the mid-1930s, Czarnikow-Rionda's market dominance had been supplanted by its major competitor, Galban, Lobo & Company. Although it continued to play a significant role in Cuba's economic life, Czarnikow-Rionda never regained the influence it enjoyed during the first three decades of the twentieth century. In his last years, Rionda was preoccupied with keeping his various businesses afloat. Despite losses in its market share, Czarnikow-Rionda escaped dissolution and Francisco, Manati, and Cespedes passed through receivership still under the control of the Riondas. San Vicente and Washington, however, were sold. As the years progressed Rionda’s participation in industry affairs waned, but he was active until his death, at 89, on September 2, 1943. Rionda was succeeded as president of Czarnikow-Rionda by his nephew, Bernardo Braga Rionda. Manuel Rionda was the epitome of the hands-on industrial manager and demanded of his subalterns, many of whom were nephews and in-laws, detailed and regular reports. He required prompt and detailed correspondence from each mill manager and company president. Rionda also responded personally to the entreaties of his colonos. Colonos were cane farm operators, and the Rionda estates relied almost exclusively on the colonias to acquire cane for their mills. In some cases, the farms were independent of the mills and could offer their cane to several buyers. Most, however, were tied to one mill through loan agreements, land tenure, or family association.